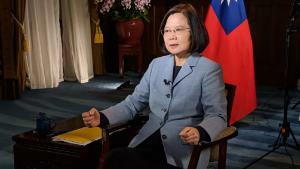 Taiwan President Tsai Ing-wen has sent out a warning to Asia in the face of mounting aggression from Beijing. In an exclusive interview with CNN, Tsai said the military threat posed by China was growing “every day” in line with a more assertive foreign policy under its President Xi Jinping. “If it’s Taiwan today, people should ask who’s next? Any country in the region — if it no longer wants to submit to the will of China, they would face similar military threats,” said Tsai.